My Aunt and I came up with our wedding decor theme name very shortly after Jim and I got engaged over coffee in a John Lewis Cafe. We were flicking through some wedding magazines and noticed similarities in all the decoration-y things I like. It was what we affectionately referred to as 'Potting Shed". I think it summed it up pretty well - Recycle/upcycled, rustic-y, lots of glass and pretty but handpicked looking flowers and no sparkly bits. 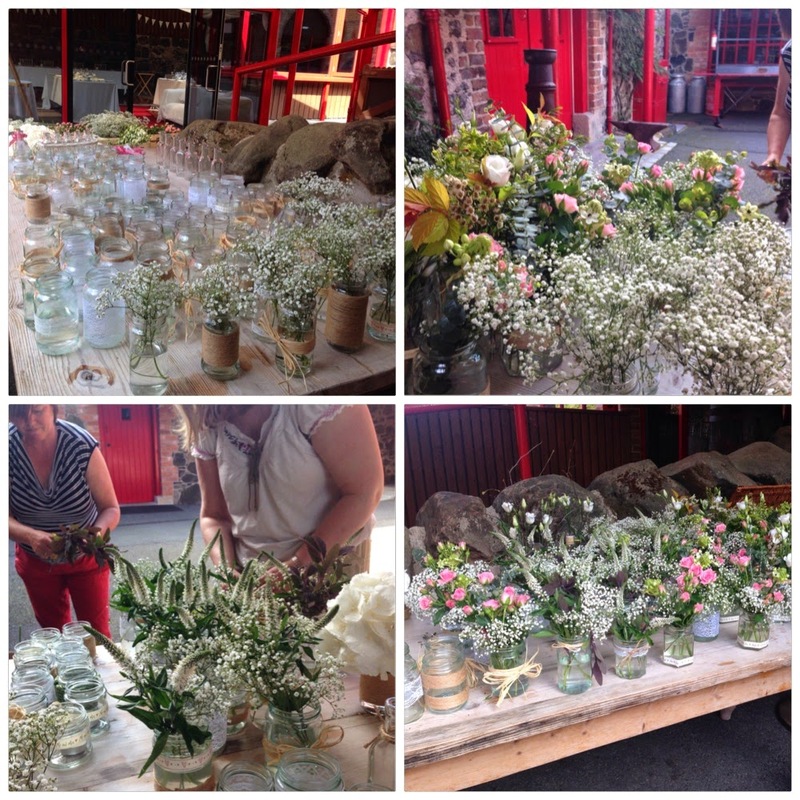 We pretty much started saving Jam jars the moment we got engaged so after 2 and a bit years we had enough (with some to spare) to create all our table centres, window sill decorations and coffee table decorations. We spent a lot of time removing labels from jars (worst part of DIY jar table centres) but once they were all clean we began the upcycling. Through my excessive Pinterest-ing (is that a verb yet?) I had seen a few simple yet effective looking DIY jar tutorials, so with these in mind, I sourced some brown garden twine, vintage-y looking lace, ribbon and raffia. We thought about buying a glue gun but instead decided to go down the less messy and extremely convenient route of double sided tape. The stuff we had was super industrial and quite wide so worked perfectly - the jars only had to last a day after all! I just applied double sided tape to the jars and then wrapped the different decorative bits and pieces round them, so simple!! 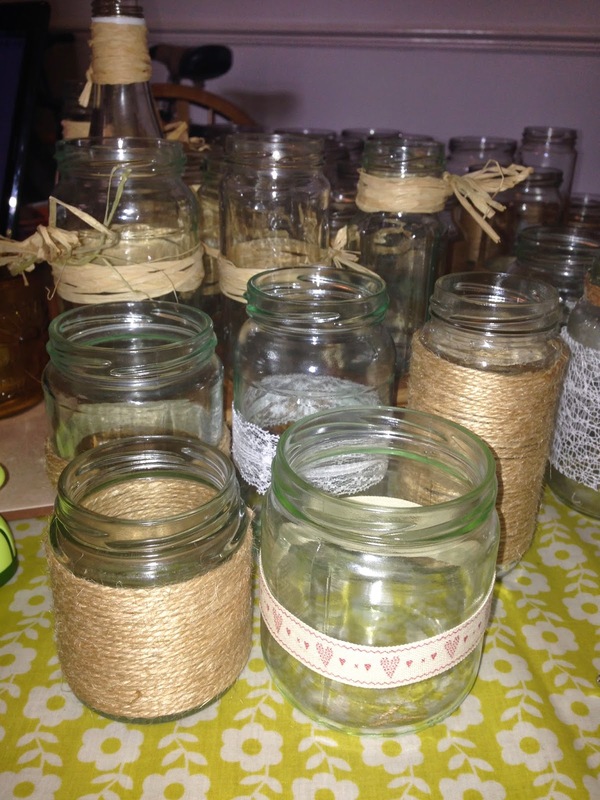 I tried to decorate each jar slightly differently - the twine and the raffia ones where my favourites. Once we'd decorated all the jars, we boxed them up for the long drive to N. Ireland. Most survived but those that ended up slightly dishevelled were really easy to fix. The Thursday before our wedding Occasions Floral Design delivered our flowers, plus some gorgeous pieces of foliage from Jim's mum's garden, to Riverdale. Sharon had brought a flower food type solution to be added to the water so the flowers would still look gorgeous by the weekend. 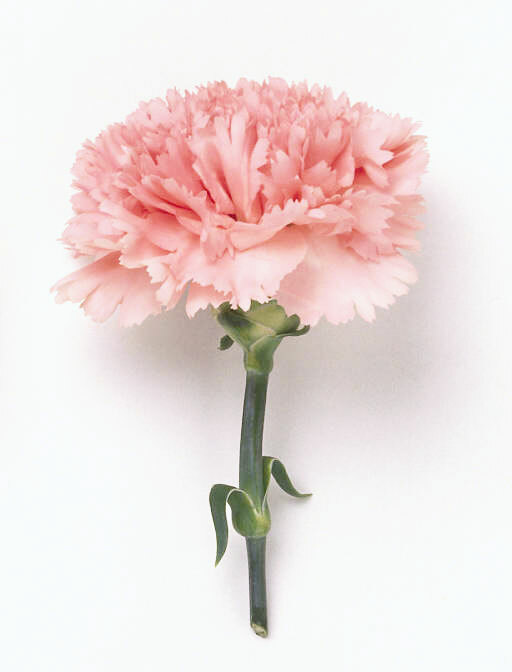 The flower had been perfectly conditioned to be at the peak for the wedding! Sharon's advice and guidance had been invaluable. As we had nice weather we sat outside at Riverdale to arranging the flowers and despite having no experience in flower arranging, I found it very relaxing and was pretty happy with the results. 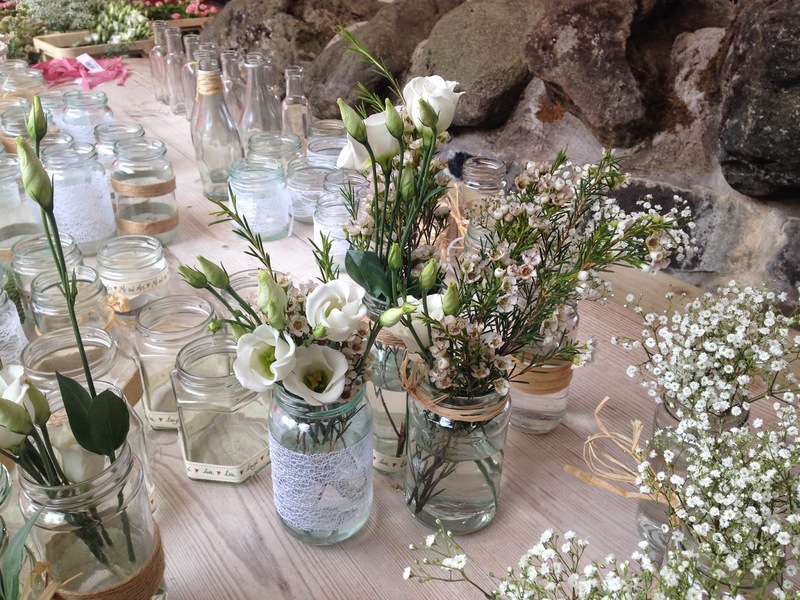 I'd written down some arrangement ideas before we got there, and thankfully they looked pretty good in the jars. 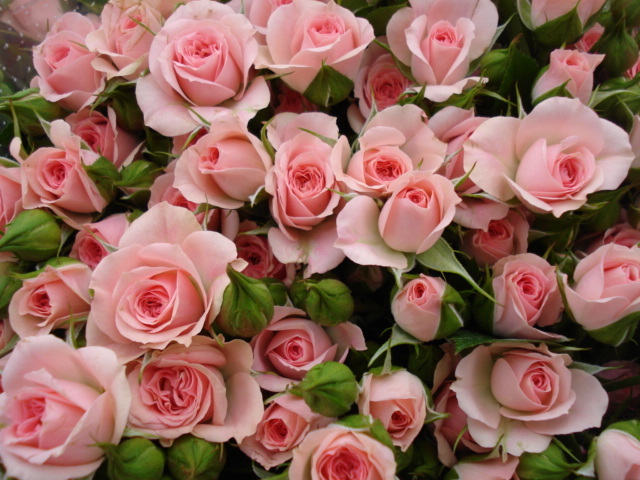 - 1 Ornithogalum, 2 Pink spray Roses and some foliage. 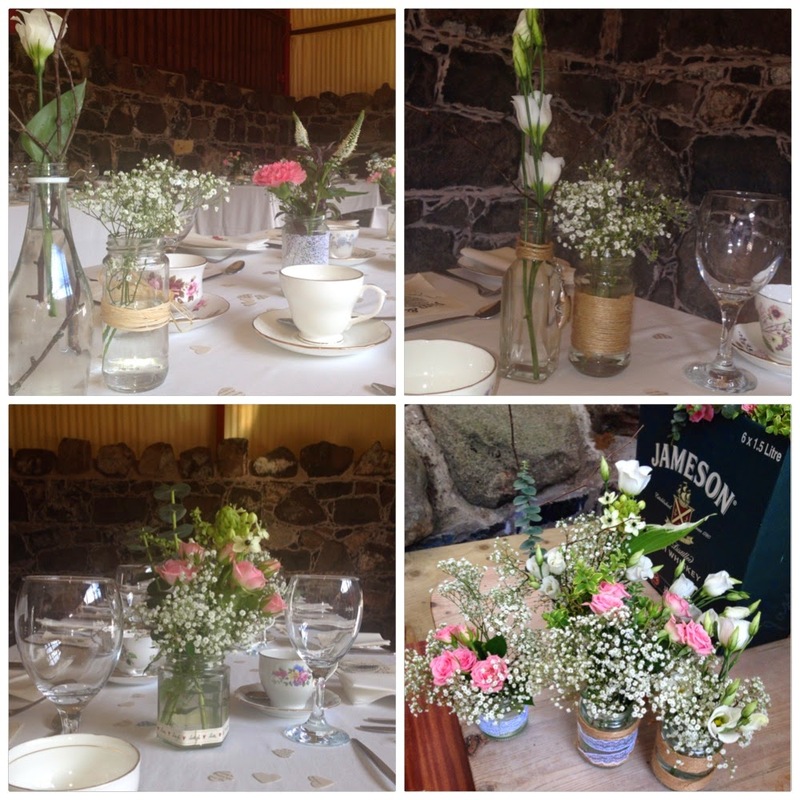 After we'd arranged these jars for the tables we created some other arrangements with the remaining flowers. We started to arrange them on the tables along with our scattered hearts, (hand punched by my mum from old books). Along side the mismatched cups and saucers we thought they looked great and slowly everything started to come together. Jim's mum and his brother had constructed the most beautiful arch for us to stand in front of during the ceremony. It was made from twisted sticks withrustic style half barrel pots as a base. Once on site, the mums decorated it with some of the same flowers we were using on the tables. As well as the flowers we also painted some old pictures frames we had to dot round the venue with directions or instructions inside them. I applied a base coat with some left over paint we had then my brother Richard finished them with some spray paint. Richard also got a bit crafty with some bottles, a glue gun and some spray paint (bottom central image below). 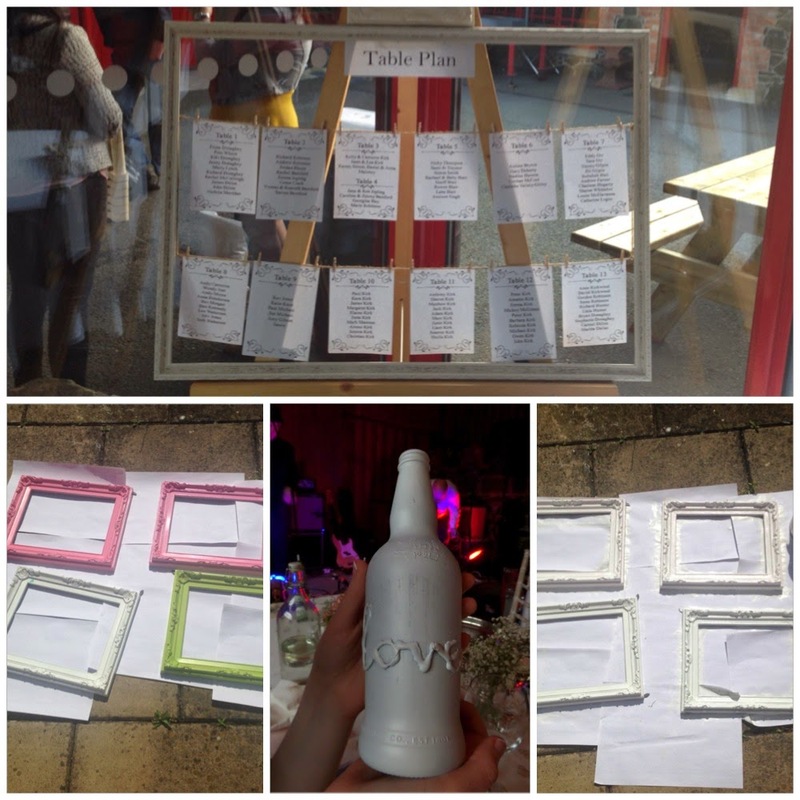 Our table plan (above) was an oldish shabby chic looking frame that we removed the back from. 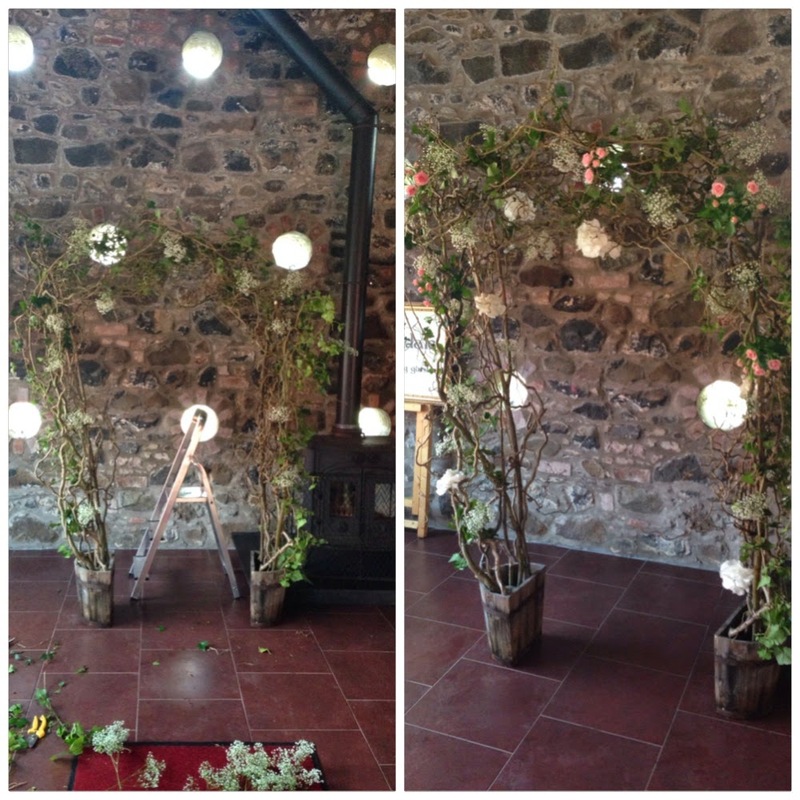 We then used some garden twine to create two lines to hang table plan details on. Jim designed and printed these. Disappointingly the frame has disappeared and Jim and I really wanted to use it to create a wedding collage for our house. We're hoping it turns up, it's not like anyone could fit it in their clutch bag! Although I'm sad the wedding it over we now have some amazing memories that will stay with us for life. I think I'll continue to post about our day, now that our plans are no longer a secret and as we have some lovely pictures from the day. I think it will be lovely to be able to relive our day through through these blog posts.